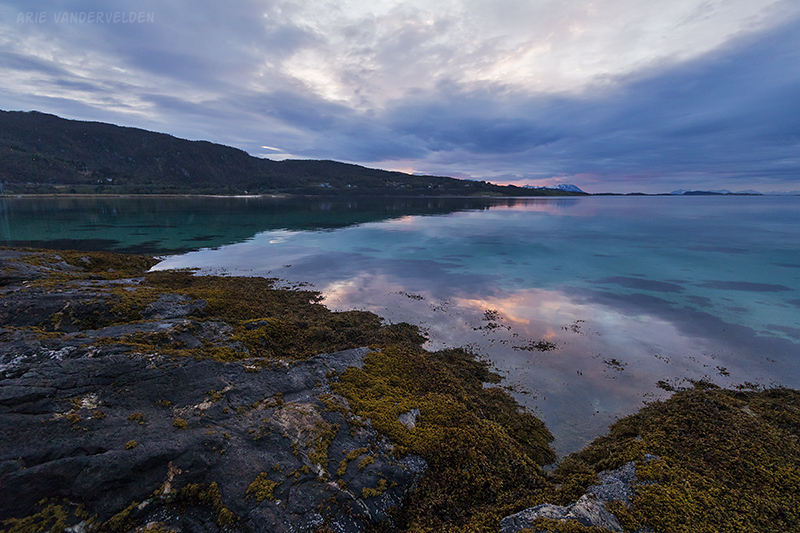 Lofoten is an island chain that juts way out into the North Atlantic. Spires of granite soar up from the sea. The E10 highway that crosses the island chain is a miracle of civil engineering, winding around the mountains, crossing intervening fjords on bridges or through tunnels. It’s one of the most spectacular drives in the world, in my opinion. What’s more, there are no expensive ferries or toll booths; you can drive this road for free. 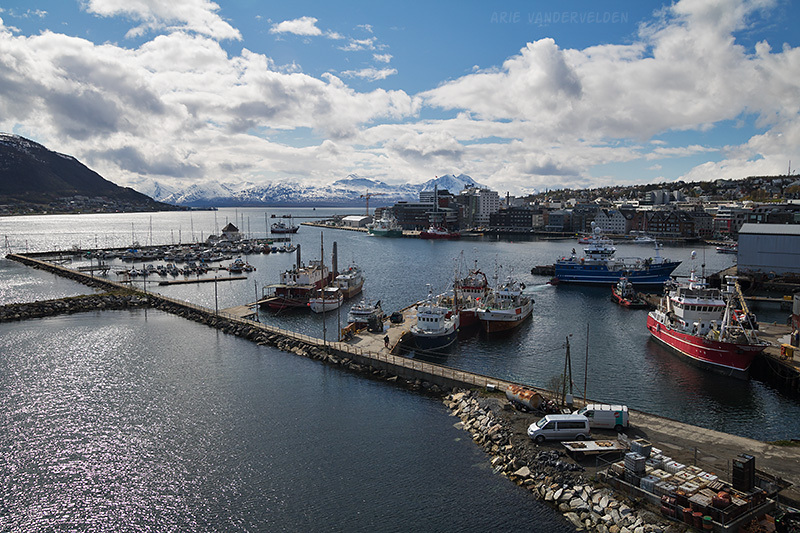 We flew to Tromsø, northern Norway, to start our tour of the Lofoten Island chain. Its location is just shy of 70 degrees north latitude, well above the Arctic Circle. That’s farther north than Iqaluit, Baffin Island, or Nuuk, Greenland. We arrived around midnight. It was still quite bright outside – I don’t think the sun was up, but it was probably just peeking below the horizon. Yes, 24 hour daylight! 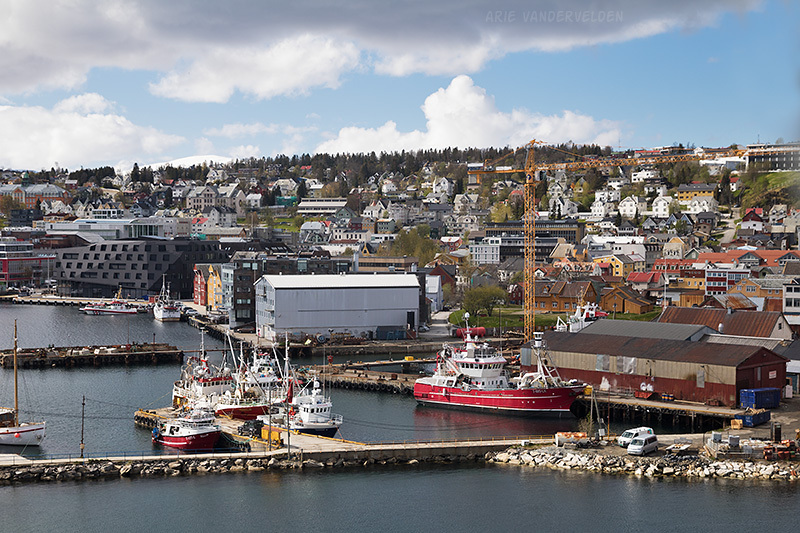 Tromso, population about 72,000, is the regional center of Norway’s far north. 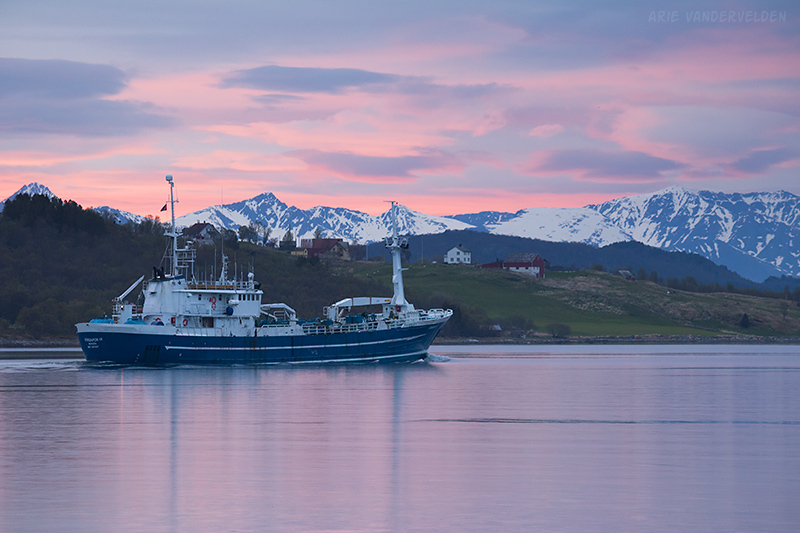 Its harbour hosts a substantial cod fishing fleet. The town itself is on a hillside. Cunningly, there is a system of car tunnels inside of the hill, complete with underground roundabouts, that allows you to get around town very quickly. I suppose these roads stay snow-free in winter. It’s a unique system I’ve not seen elsewhere. I always like walking around harbours, looking at ships and fishing gear. Interestingly some of the big fishing vessels have wooden hulls. 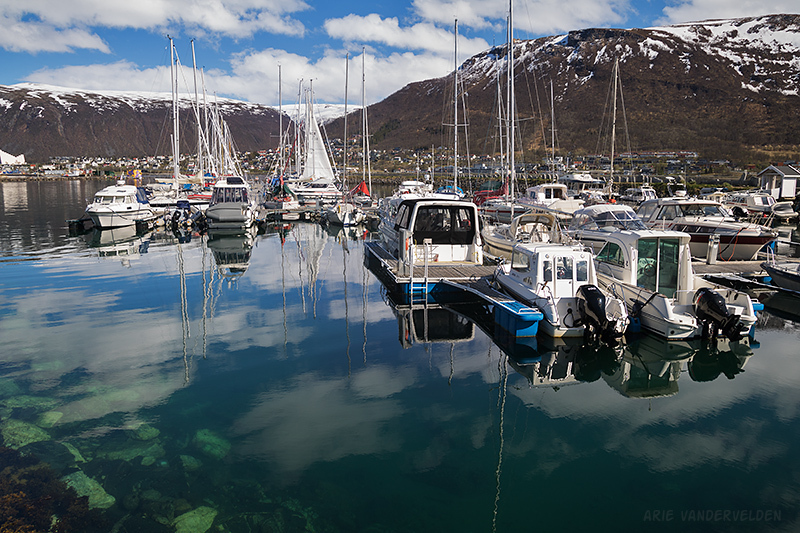 Tromsø also has marina for pleasure craft. 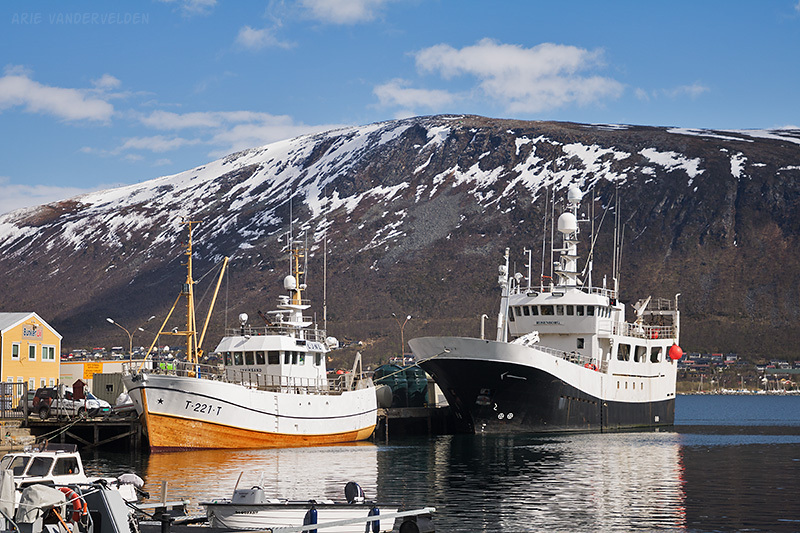 At first glance you wouldn’t think of the Arctic as a yachting destination, but given the endless expanses of protected waters within the fjords, great fishing, and the stunning scenery – why not? 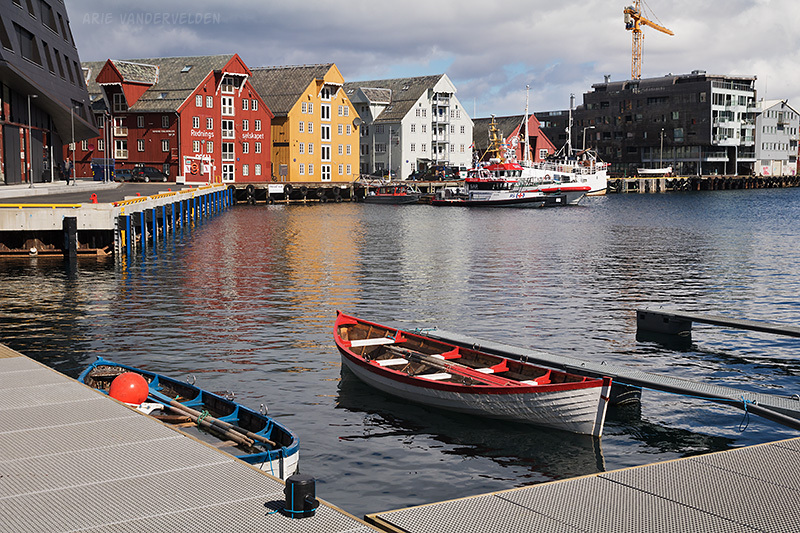 There is a pretty little inner harbour as well. 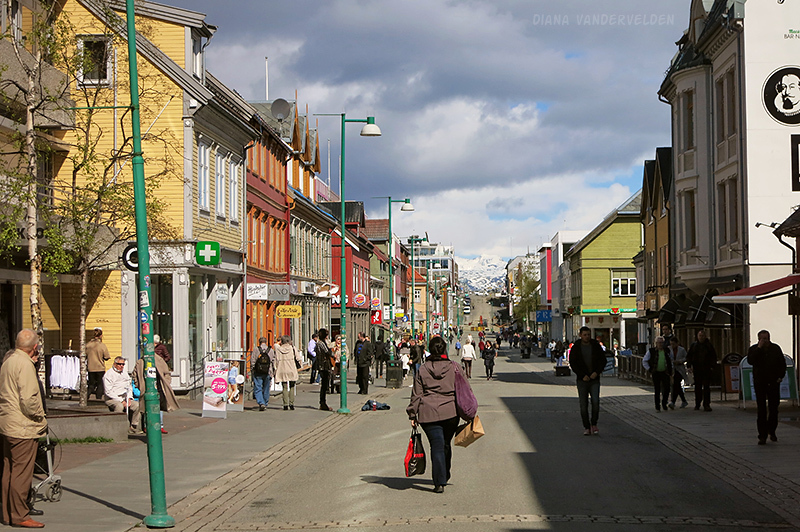 Tromsø boasts of its records: the northernmost this, the northernmost that. Keen eyes will spot a Burger King in the next picture. It’s a block ahead on the left. We patronized this place one evening. So now we can say we have dined at the world’s northernmost Burger King. 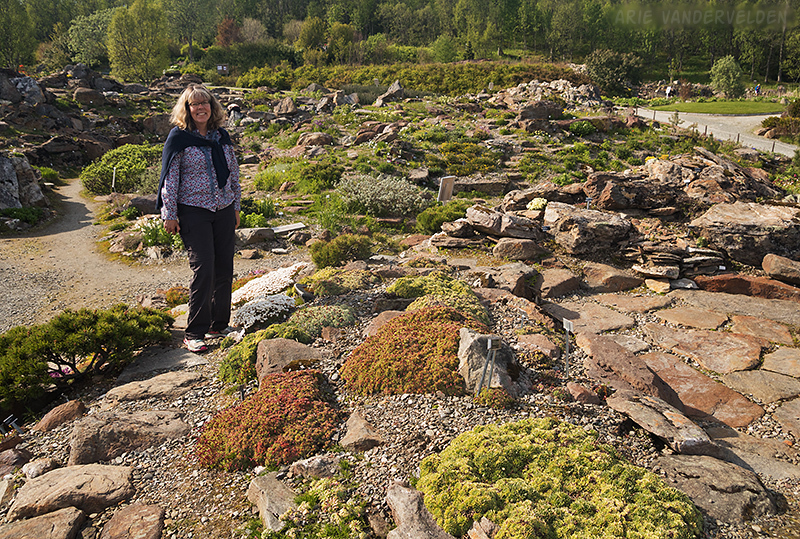 We visited the world’s most northerly botanical gardens. The collection of course is focused on Arctic and mountain Alpine species. I recognized quite a few of the plants: the saxifrages, moss campion, penstemmons, dwarf willows and rhododendrons, and more. 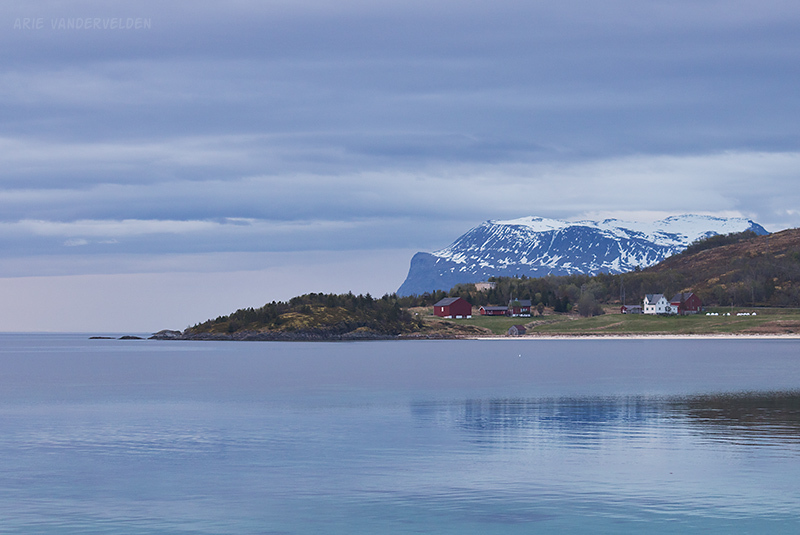 We picked up our rental car, loaded it up with our stuff, and after stopping by a grocery store we set off down the road, to the southwest, towards the Lofoten islands. It was a cloudy and windy day. Roadside pullout overlooking a fjord. 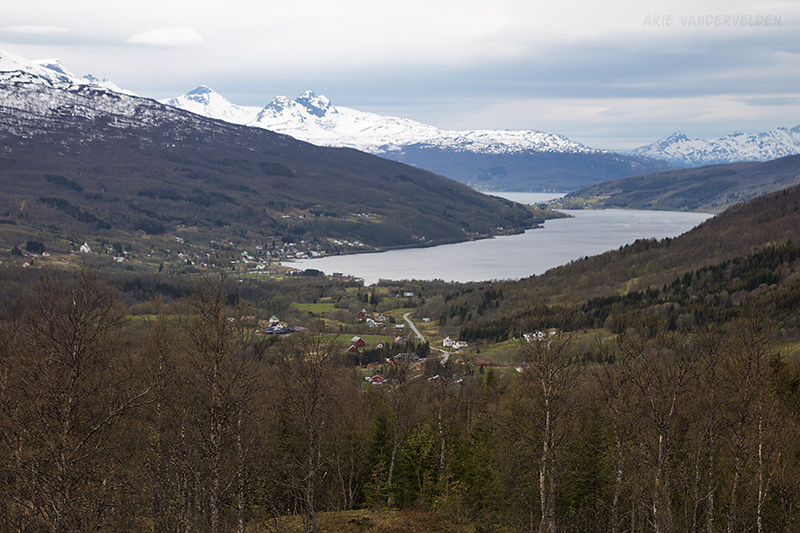 The road started by winding along the fjord, and then turned inland to cross several mountain passes. View to a village at the head of a fjord. 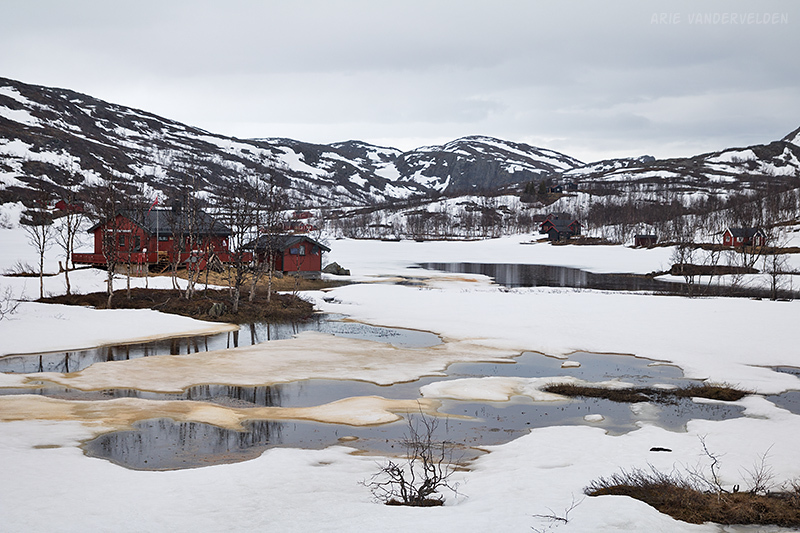 The areas inland and up from sea level were still very much snowbound, and with the cloudy weather the scenery was bleak. Slabs of gneiss line the edge of a fjord near Bjerkvik. When we got to Bjerkvik we took a 30 km detour to the Swedish border. Diana had never been to Sweden, and now she has, technically. Just across the Swedish border is a ski resort, where we turned around and went back into Norway. Interestingly, the bleak alpine areas are dotted with little cabins. Every Norwegian must have one, judging by the sheer number of them. I suppose people come in winter to ski, and in summer to fish and to pick berries. Cabins near the Swedish border. 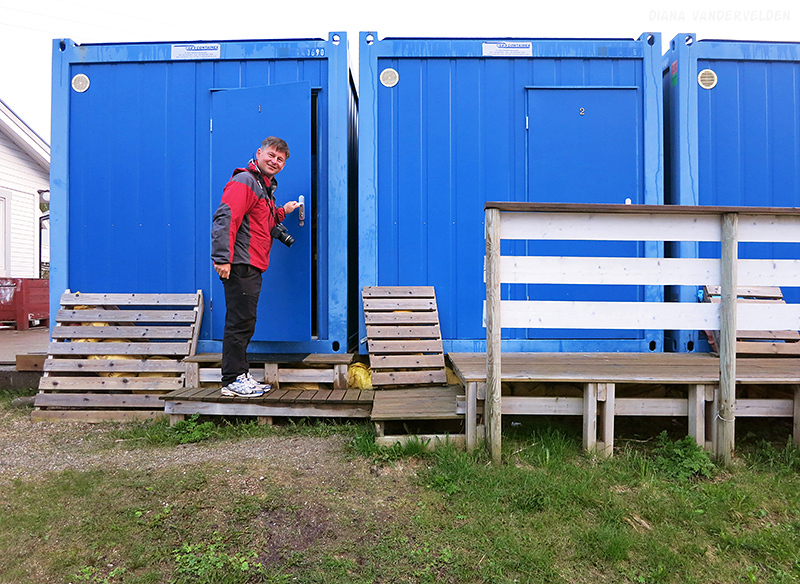 We drove on to Tjelsundbrua, where we had rented a shipping container at a campground to stay in for the night. Why a shipping container, you may ask? Well, accommodations in Norway are not cheap, and the price was right for the container. 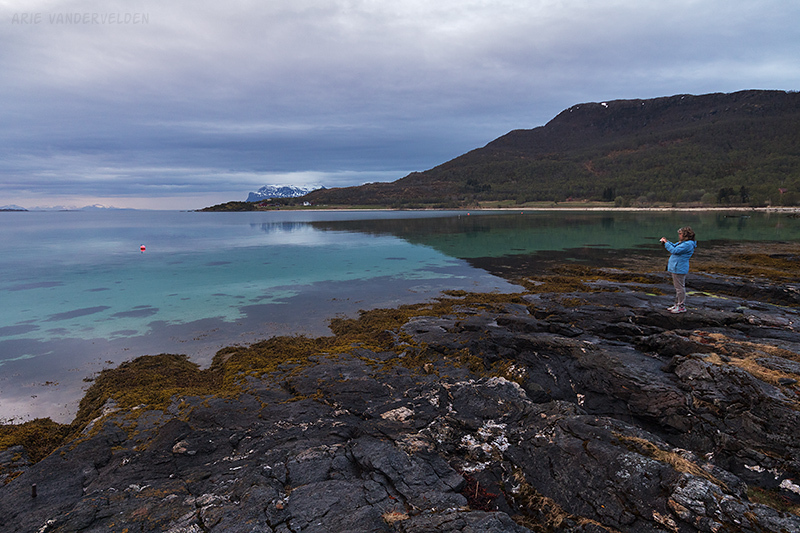 We figured it was just a stop along the way, and we opted for nicer accommodations once we got to the Lofoten proper. Besides – how often do you get to stay in a shipping container? We laughed about it, and it’s something we’ll always remember. Home for the night – a shipping container. The campground host was Polish. He was a super nice guy. I told him we planned on staying here again on our return, and he rented us sheets and towels for the duration of our entire trip, rather than just for the night. And when we came back he upgraded us to a slightly less spartan cabin. 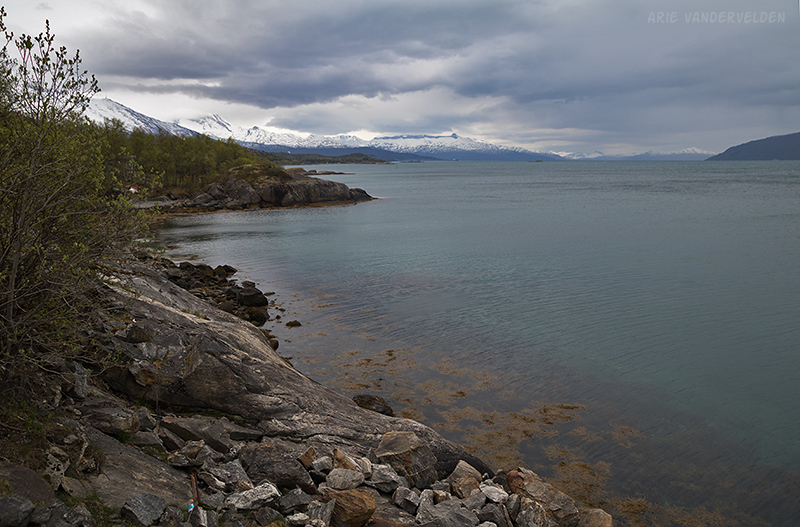 The campground was located along the edge of a fjord. In the evening there was some really nice light. Diana takes a photo under the midnight sun. In the distance we could see a house at the edge of the fjord. The rocks at the edge of the fjord were black mafic gneisses. Beside the black rocks was a small beach, which was as light in color as a tropical beach. I asked myself: how can this be? The sand should be black also. 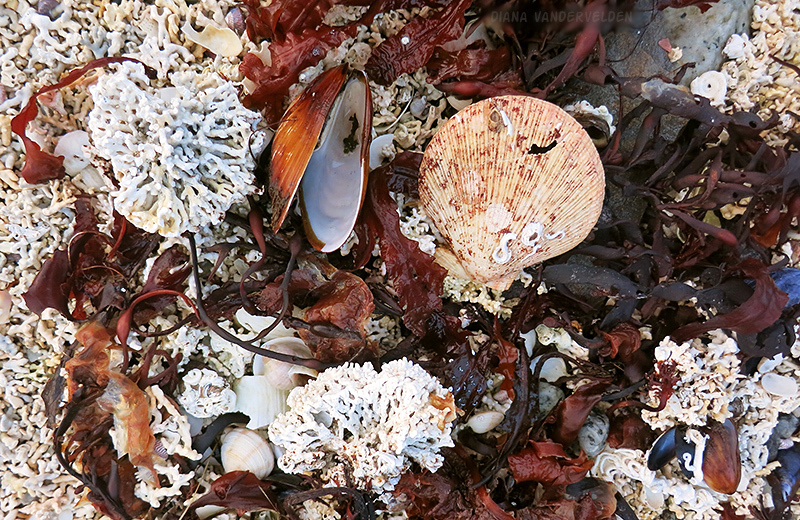 Then I looked down and saw what appeared to be chunks of coral. Now I was really confused. Not quartz or feldspar, but coral. Did they ship this stuff in from the Philippines or something like that, just for the campground? No. 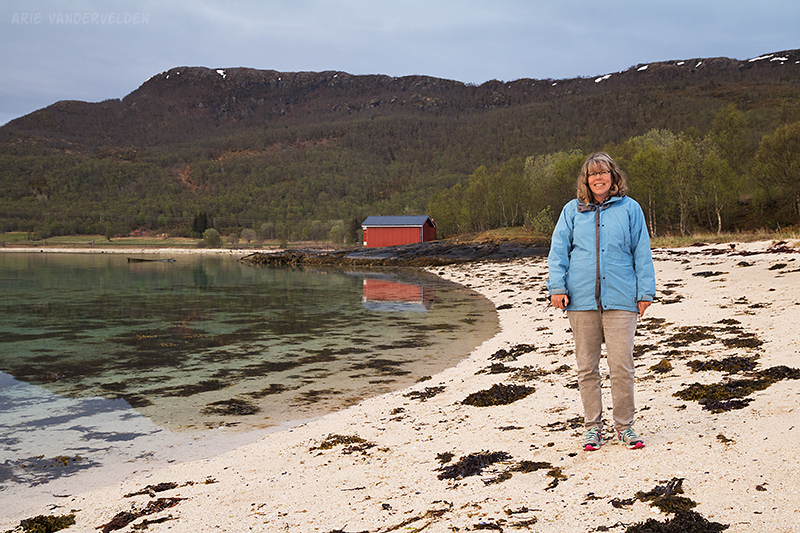 It turns out that there are cold-water coral reefs in northern Norway and white coral-sand beaches are common around here. Who knew? I learned something. The fjord is an important navigational channel. We watched ships go by. We flew to Tromsø with SAS from London Heathrow, changing planes in Oslo. From Tromsø airport there is a bus that goes to downtown Tromsø. 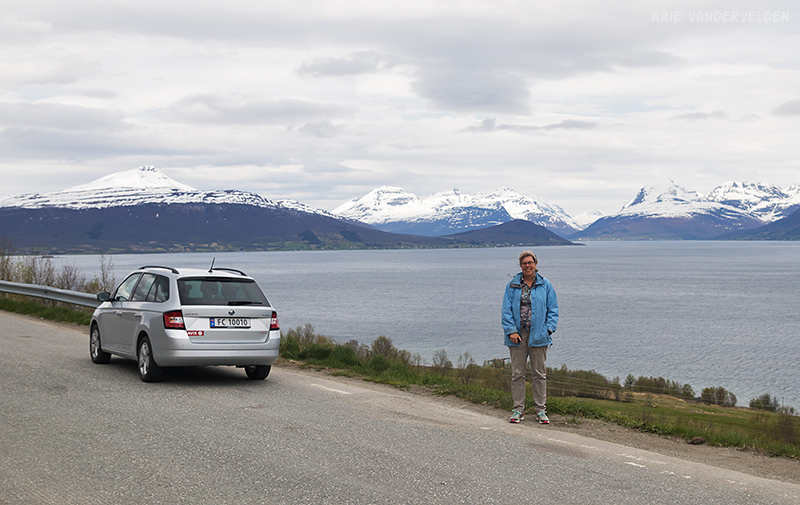 We rented a car in central Tromsø rather than at the airport, which saved us some money. 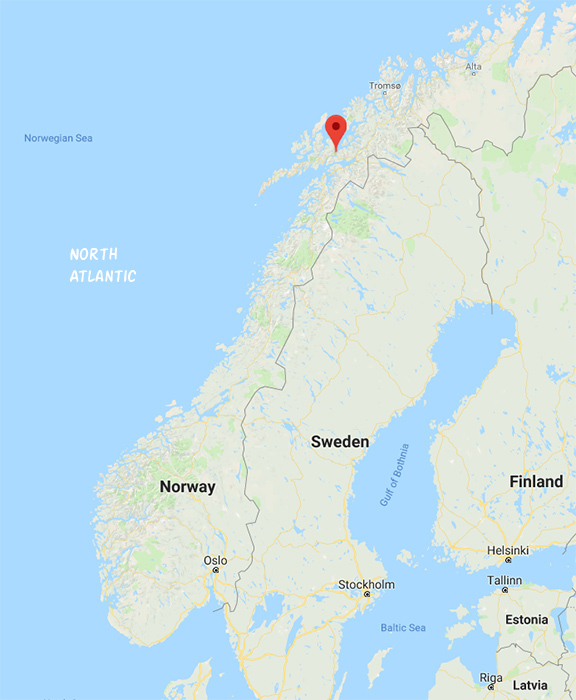 Tromsø to Tjelsundbrua is about 275 km, which takes about 4 hours of driving, not counting stops. I brought my own Tomtom GPS. For the most part navigation is trivial: you just follow the road. However there are a lot of hidden speed traps in Norway, and my Tomtom had them conveniently programmed in. It beeped every time we approached one. If you’re not aware of these speed traps you could be in for a nasty surprise when you return your car! We traveled in late May.